Some shocking news just popped up this morning (thanks, Roan). The winner of this year’s Gran Fondo New York tested positive during the event. The 3rd place woman was also busted. First, why this is NOT shocking. 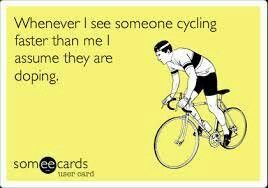 The sport of cycling attracts many types of people, but I would gather to guess that at the upper end of the average leaderboard you’ll find some riders whom you might label as ‘Type A’, if you were being kind. It’s no surprise to me, even at the amateur level (and really, we’re not even talking real amateurs – mainly ‘Masters’), that some riders will dope to win. No, what was surprising was the fact that these two cheaters were caught at all, i.e. there were doping controls. GFNY was apparently the first gran fondo to implement these tests, and they’ve already caught these two from this year, as well as a couple more from 2012. I have a little experience now with ‘serious’ sportives, like Etape du Tour, Haute Route and La Marmotte, and at least the first two of these events state in their FAQs that doping controls can be carried out at any time. But the thing is – and feel free to correct me if I’m wrong – I don’t think they’ve ever followed through on their threat. I’ve certainly never seen any and I’ve done 4 Etapes and 2 Haute Routes now. So bravo Uli Fluhme and GFNY for walking the walk. Hopefully other ‘serious’ events are paying attention. The picture is funny, but it does cross my mind many times. It’s just ridiculous. It’s not cheap, I am sure. I wonder if it’ll be the next big thing to spend money on in cycling…? I hear ya, Luc. I was ready to take nearly anything after that first day into Megeve! Hi Gerry, Funny you say the Haute Route say you can get tested randomly. I heard in Nice last year the tested the top 10 GC and some randoms. I then said to the guy thats not true, he looked confused and argued they did. I then said I was in the top ten and I did not get tested. 100% agree with you, they should put a testing policy in place and no previous dopers too, same as Taiwan KOM….! I can’t prove anything but I am fairly sure, like you, that there would be a lot more taking something or other on these so called “amateur” races than people would think. Also when put a watch worth several thousand euro’s as a prize, thats a big lure..! Its all very sad, we never know where we should have really finished. Hope you are fit and well. That’s hilarious, Paul! You’d think people would hear the rumors if testing were happening. It’s good to hear a comment like yours from ‘the pointy end’ of the race, though! I’d love to see you shows up and who doesn’t if HR brought in strict testing! Amazing, but not surprising that there are people out there that would cheat for something as insignificant as an amateur bike race. Yeah, people will cheat for far less in life, I guess. Human nature? I had friends in high school doing steroids to play football. High school! So I wonder about the idea of doing any sort of non–professional sporting event. If the general feeling is I don’t care if you were 1st or 500th as it is all generally meaningless when compared against all other issues in the world, then good. But I suppose that the problem is that people train and want confirmation of some sort of the training that they have done. May be the issue is that current office work is not demanding enough to show the impact of an exercise program. When I was a little kid I used to ride around the block from my house, out of sight of my mother and then come back with some story to tell, like I rode to Ottawa. I never could imagine the idea of seriously riding to Ottawa when I actually only rode 500 meters down the street. I hope to have a chance to ride up Mont ventoux some time in the future. Thereis no one to tell about it because no one really cares , sort of like holdzy slides. I am transfixed by the mountain, and I got engaged under the SIGN. I hink the real reason is that there is no need to ride up it so there must be some value. Like making life thicker than what it would be otherwise, like gravy made better by standing and stiring instead of just serving what you have. I suppose what I am saying is that people n the same way I lost faith in pro racing I have lost faith in amateur racing and I will ride for the feeling of salt crystals on my eyelids and not pay attention to anyone else. Thanks for listening…very jealous and Nimes is a wonderful town. Kevin, awesome response. I love your reasoning on the ‘value’ of Ventoux (or any other mountain, I guess). People create their own stories, so maybe dopers in gran fondos will be like you when you were a kid and tell everyone they won a stage in the TDF. With all the fake news flying around these days, it’s not out of the realm of possibility that some would believe it. Where do you live, btw? That is, how bad was that story you told your mom?! Gerry, missing your stories. Doping by two Italians before this year’s Giro 2017 even starts!! Really? Are they stoopid or something? Thought we got over that crap. I had forgotten I had posted a comment as I had come in from the pub and was feeling unusually textacious. Kevin, it sounds like you NEED to get over here and climb Mont Ventoux…and a few others since you’ll be here, obviously. Looking forward to meeting you when it happens. Your last comment was presented to my wife and she thought that was a very good idea. Now I need a map to align cols with spas and restaurants.